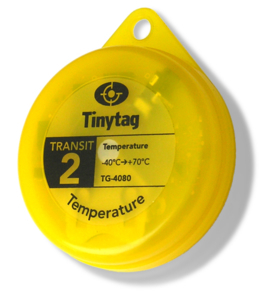 The Tinytag Transit 2 temperature logger complies with BS EN 12830, making temperature monitoring of the transport, storage and distribution of chilled, frozen, deep and quick-frozen foods within EU guidelines more affordable. The Transit 2 data logger is a simple to use, low cost logger with no compromises. Practical, lightweight and cost-effective, the Transit 2 is fine-tuned for monitoring the transportation of foods, pharmaceuticals and other temperature-sensitive products. The unit is splash-proof with a temperature range of -40° to +70°C. Its BS EN12830 compliance makes temperature monitoring of the transport, storage and distribution of chilled, frozen, deep and quick-frozen foods within EU guidelines more affordable. The unit is accurate, reliable and shows clear graph displays when used with Tinytag Explorer, the easy-to-use data logging software used to operate all Tinytag data loggers. The Transit 2 logger offers both cable and inductive download options with the same unit, instead of a different Transit for each download method. Using the logger with a USB cable offers a very cost-effective solution for single unit downloads but when there is a need to download many units, the inductive pad option is much easier and faster.